Predicting something in baseball 3-plus years away often times looks foolish. And I have the evidence to back that up. This is a fun exercise to see what a future team could look like at the present time. Baseball America does this and does not take into account free agent signings (from outside the org) or trades, because those are even more difficult to predict. For fun, here is the lineup I projected for 2017 … back in 2014. Nailed it, especially with Navin (who isn’t even with the org anymore). Should be a strong position, regardless of who the starter is. Austin Barnes: Will be 30 years old, in his last year of arbitration and could either be traded (to save money) or moved to another position. Yasmani Grandal: Will be 31 playing in the second year of a 4- or 5-year contract, hopefully. Kyle Farmer: Could very well be with another organization at age-28. Will Smith: 2016 1st-rounder could be the primary backup to the starter. Grandal had the best season of his MLB career to date and will have been re-signed or extended by the Dodgers by this point. While Barnes and Smith are nice options, it’s hard to get a lot better than Grandal behind the plate. The Adrian Gonzalez era will have been over for a full season. Cody Bellinger: Should be in his second season starting in the lineup at age-24 — most likely at first base. Ibandel Isabel: Big power, not very athletic and extreme outside chance of actually playing 1B in LA. Edwin Rios: Some of the best raw power in the org, but is a question mark defensively could lead him to become trade bait. Justin Turner: Will be 35 and in the last year of his deal; could move to first base with Bellinger in the outfield. Odds are the Dodgers won’t have signed a free agent before the 2019 season (Manny Machado) to force them to move Turner across the diamond. Bellinger is already a plus-plus defender at the position and will be in his third full MLB season. The future is bright for him. There are plenty of options here with no clear-cut favorite. Austin Barnes: A move to second base to give him a chance at the MLB level might be in order. Willie Calhoun: The 25-year-old will hit for the position, but can he handle it with the glove? Omar Estevez: Big-money Cuban signee could be ready to challenge for the starting gig. Jose Fernandez: Small-money Cuban signee will be 33 and probably not a big factor. Logan Forsythe: If he is re-signed, the 32-year-old would be the starting second baseman. Enrique Hernandez: The 28-year-old will be going into his last year of arbitration. Forsythe is the best all-around second baseman of anyone listed above. Sure, he’ll be in his early 30s, but he doesn’t have the normal mileage a player of his age might. He’s also versatile, which could help keep him around. He’s a free agent after the 2018 season, so he’d be in the second year of any deal he signs with the Dodgers. This one could change, but there are internal options to handle the hot corner. Oneil Cruz: Big kid who grew since turning pro; might have to shift to the outfield; should hit. Brendon Davis: Athletic 22-year-old could be knocking on the door of the majors by 2020. Corey Seager: About the only way this happens is if the Dodgers sign Manny Machado after 2018. Justin Turner: Despite being 35, he’s probably the clubhouse leader and in the last year of his deal. Assuming no trade or free agent signing, Turner should be able to handle the hot corner for one more season. The Dodgers gave him a 4-year deal knowing they’d have to possibly play him at third base through his age-35 season. Not much hope for the youngsters. Ronny Brito: Could be in the upper minors at age 22; has the highest upside outside of Seager. Brendon Davis: Will likely have to move off shortstop, but has been playing there in the pros so far. Gavin Lux: 2016 1st-round pick would have to hit well enough to even consider moving Seager to third. Erick Mejia: More likely a utility player than a starter. Corey Seager: The 25-year-old will be entering his fifth MLB season and second year of arbitration. It’s going to take a massive free agent/trade acquisition or one of the kids performing incredibly well to get Seager off the position. Seager finished third in MVP voting in 2016 and won the NL Rookie of the Year. He might very well have an MVP award in his trophy case by this time (and hopefully a World Series ring). Lots of options, but no franchise-altering talents. Willie Calhoun: If he has to move from second base, left field is a likely landing spot. Yusniel Diaz: Toolsiest player on this list with the best hit tool; will be 23 years old. Mitch Hansen: The 23-year-old might not ever get a chance in LA. Johan Mieses: Big power, but free-swinging approach could keep him from ever reaching the bigs. D.J. Peters: Athletic 2016 draftee could be a sleeper in this. Ariel Sandoval: Another toolsy, athletic player whose approach isn’t great. Trayce Thompson: Would be in second year of arbitration at age-29; could be trade bait. Andrew Toles: Would be 28 and heading into his second year of arbitration (depending on playing time). This was the toughest decision. While Diaz has the tools and body to be a major leaguer, Thompson’s athleticism and potential could win out in this battle. He’ll be a grizzled veteran by this time, and he has more ability than anyone listed. Given a shot, he could be a first-division starter. He’ll need to stay healthy, though. As long as the incumbent is healthy, this is Joc’s spot to lose. Yusniel Diaz: Has the chops to play center field, but it’s going to be hard to supplant the current starter. Brett Eibner: Athletic, will be 31 years old, should be a fourth outfielder-type. Joc Pederson: The 28-year-old will be in his last season of arbitration; extension could be in order. Trayce Thompson: Would need Pederson to under-perform for him to overtake Joc. Alex Verdugo: The 24-year-old should be firmly entrenched in the Dodgers’ lineup, but not in center. I’m predicting a big breakout season for Pederson in 2017. If he does, he should be one of the game’s most productive hitters. There are some solid options, but none of them are better than Pederson. A couple years ago, this wasn’t even a question. Johan Mieses: The 25-year-old would have to tap into his power in-game to be in consideration. D.J. Peters: If the junior college draftee performs well, he could be a sleeper to take this position. Yasiel Puig: The 30-year-old will have been a free agent the year before; could be on a different team. 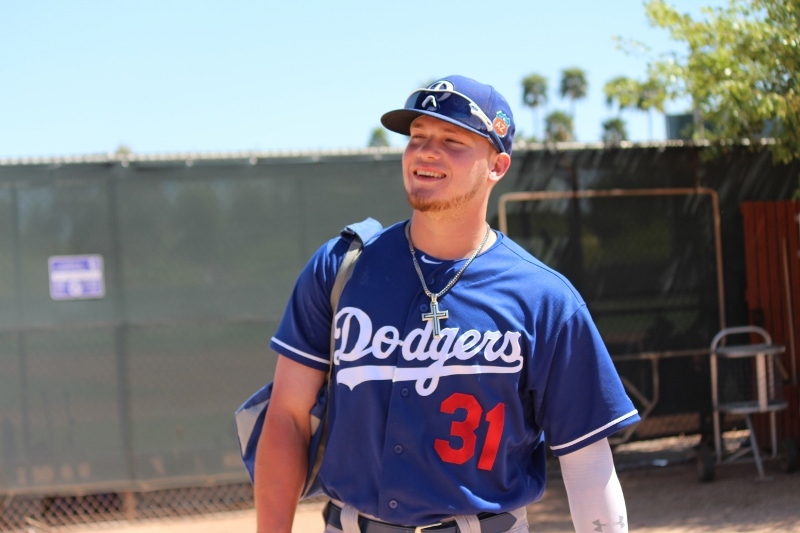 Alex Verdugo: Even if Puig doesn’t leave, Verdugo could easily be starting in right. While I’d love this to be Puig, he’s too inconsistent to count on him three years down the road. Instead, Verdugo will (probably) be in his third MLB season and could be one of the better right right fielders in the league. Peters is interesting but probably won’t leapfrog Verdugo. No matter what happens, the Dodgers are going to field an awfully strong team. There will be a few differences, but they should still have a strong team with a solid farm system. Free agency and potential trades could change this, but it wouldn’t be surprising to see the starting lineup comprised of those who are already in the organization.